Darvel Dam. A difficult obstacle that roves impassable to many salon and trout. 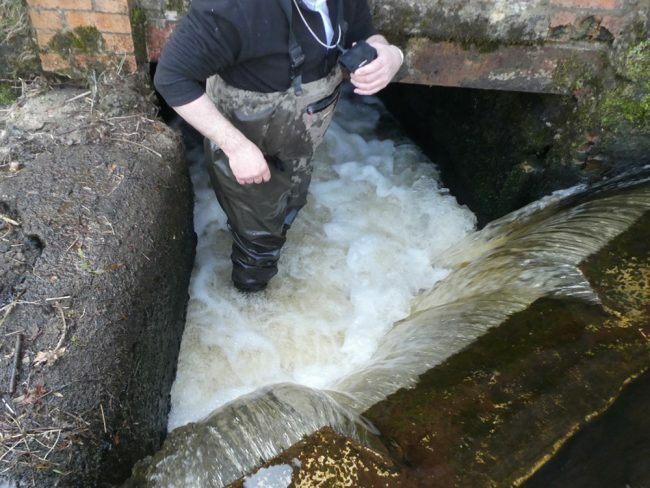 We visited Darvel today to again see if we can find something that may help salmon and trout migrate beyond the Dam that lies just upstream of Ranoldcoup Bridge. 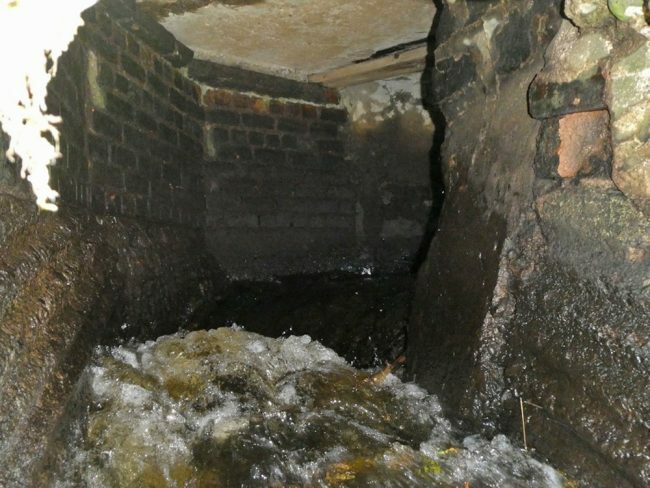 We’ve attempted to find solutions here before, first through RAFTS when Mike Beech, a fish pass specialist visited in 2008 and failed to find an affordable solution after an in depth survey of the structures. Funding will always be an issue for solutions at this structure as there is always a risk when engineering is involved and managing risk or insuring against losses when domestic properties lie in such close proximity comes at a high cost. 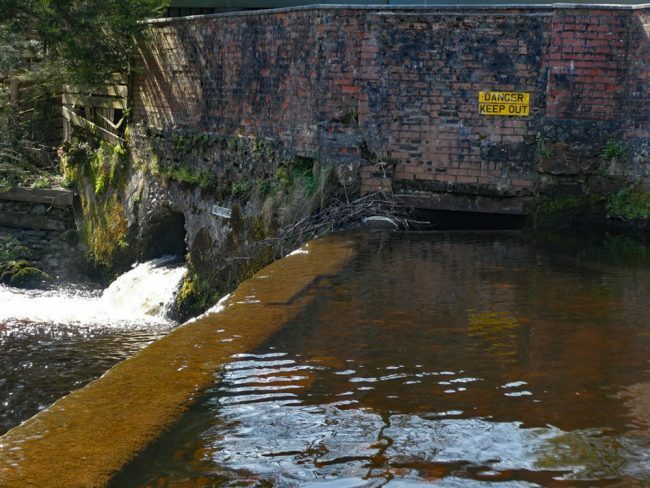 In 2014, we again invested a huge amount of staff time developing a design and proposal for what would have been the first Scottish Siphon fish pass; a novel and modern way to move migrating fish beyond difficult structures. Unfortunately the costs were prohibitive and we were unable to secure the 6 figure investment we needed to make it happen. Looking through the hole in the wall that is the entrance to the fish pass. It’s a steep gradient at about 1 in 3 before it flattens out. 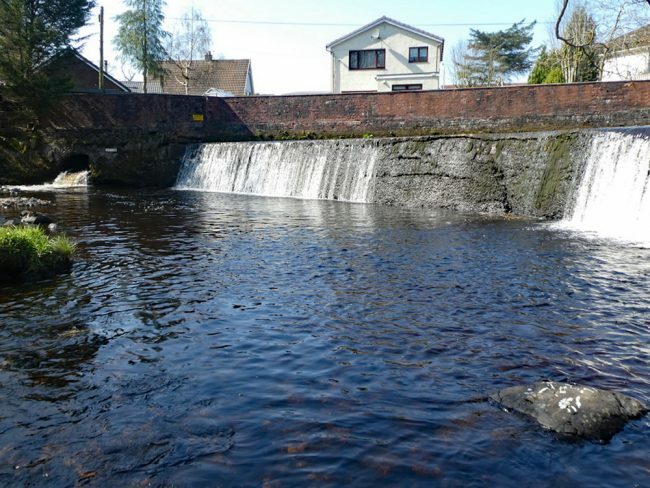 Darvel AC recently asked us if it was possible to come up with a crash mat as we had at Catrine and this prompted us to have another look at easing this dam. This time, we looked at it with refreshed eyes and a maximum budged not exceeding £5000! Is this just wasting our time or do we really think that we can develop a solution for such a low cost given the previous attempts? (We set a budget of £5K as a starting point just to see if anything is possible or comes to light). That £5K is not for crash mats, it’s to ease migration. If nothing else, we will certainly help with crash mats but we have greater ambitions than just that. We know we can’t build anything much for £5K. But, we are looking to find ways to assist fish through the fish pass (if it can really be described as that), effectively to make it more efficient. There’s always a risk than any modifications may worsen the situation so whatever we come up with will have to be removable, affordable and at best experimental. We have an idea that we are developing. One that may just be mad enough to fly. Once we have developed our plan, we will take it back to Darvel AC for discussion and then if approved, we will attempt to secure funding and the necessary permissions from SEPA. We are a long way from there at present so rather than get ahead of ourselves, we will work away on the idea and see what transpires. 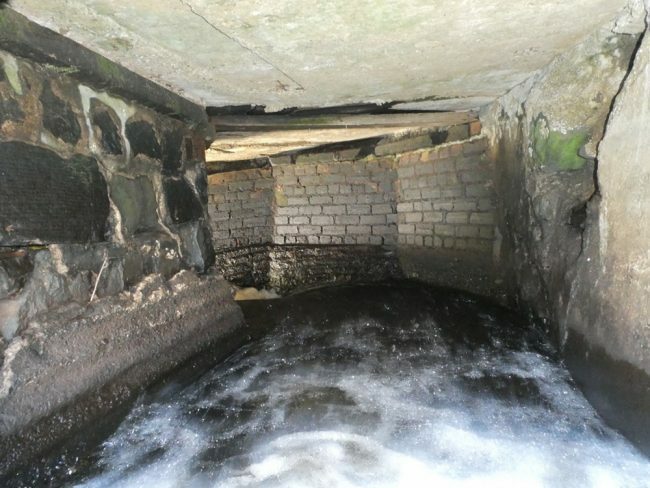 The hole in the wall is treacherous for fish and once in the chamber, getting out at the top end seems a difficult leap. All in all , this is one very tricky obstacle but at least some fish manage through each year. Let’s hope we can get more through before next winter. If nothing else, we are willing to keep trying against the odds to come up with a creative solution. If we don’t I can’t see any other way of making progress. A vertical 3′ leap from shallow depth is hardly what fish need but some make it through this each year. We’d like to see many more reaching the excellent habitat that’s available upstream.